There is something extraordinary about co-working spaces. Innovation and a sense of community thrive, help and mentorship abound, new connections seem endless, and workers report a greater sense of well-being and value. And These are just a few of the many lessons that we can learn from the co-working revolution. There are more, and this article will focus on a few that you can begin to implement now, in most work environments. One of the biggest differences between a coworking space and a traditional office is that it comprises a community of people who want to get work done but don’t necessarily have to compete with each other about climbing the same ladder. This creates an environment where the community has come together around productivity, meeting deadlines, and advancing their careers, but without the same kind of defenses that are in place when you’re sharing a coffee break with the boss. The problem for traditional employers and office managers is that you can’t necessarily remove that relationship from the office environment— no matter what your structure is there’s obviously going to be some sort of hierarchy in place. However, there’s something to be gained in terms of encouraging unexpected interactions with your layout. The Harvard Business Review’s 2015 study of coworking spaces shares this key finding: “Working amidst people doing different kinds of work can also make one’s own work identity stronger. Our respondents were given the opportunity to frequently describe what they do, which can make what they do seem more interesting and distinctive.” In other words, mixing up the type of people who you are likely to interact with on any given day is empowering. The takeaway here is that you need to find ways to de-silo your office floor plan. You’re much more likely to create a community that helps each other, rather than one that keeps their heads down and lets the chips fall where they may if you can create a difference between how people are physically arranged and who they typically work with. Consider an office layout that encourages developers to work side by side with customer service reps and marketing folks. The diversity can mean a world of difference for people who are generally stuck in the same patterns day in and day out. Now, you don’t necessarily want to take this to an extreme where people have to walk extra far just to talk to someone they need to check in with on a daily basis, but shaking up the floor plan can be extremely beneficial. An added perk to a new floor plan? One thing that coworking space users point to time and time again as a benefit of the arrangement is that other people sharing the office are much more willing to take time out of their day to lend their expertise to someone in need of help. It’s possible this happens because you don’t have to deal with people sitting next to you in one of these spaces as much as you have to deal with your colleagues in your department, so you’re in a friendlier, less competitive mindset when it comes time to lend a helping hand. Another big difference between coworkers and traditional employees is the degree of control they have over their day. On any given day coworkers might be side-by-side with someone who is in it for the long haul because they have a deadline they need to hit, while someone else is planning to come into the office to get a few things done on some ongoing projects, and then take a long break in the middle of the day to go to the gym. Giving your employees that degree of flexibility can be hard to achieve, but it has benefits for your business. As Gary Beckstrand puts it in his article about employee flexibility for Entrepreneur, “Recent research suggests that 4:00 a.m. is the most productive hour of the day.” The takeaway here isn’t necessarily that you need to get everyone to stay up late or get up early, it’s that you need to find a way to make space for your employees to work on a schedule that makes sense for them, even if it seems unusual or surprising to you. Now, there’s a lot of reasons why most businesses stick to the standard 9-to-5, one of the main ones being that you often need to work with other businesses to get things done and those are the hours that most people keep to. However, I think we can all agree that we’d rather that our employees be at their most effective and efficient when they come in for work. While some ground rules for when certain critical meetings need to happen are useful, there isn’t necessarily a strong and compelling reason why you need to mandate that employees are in the office from X am to Y pm. 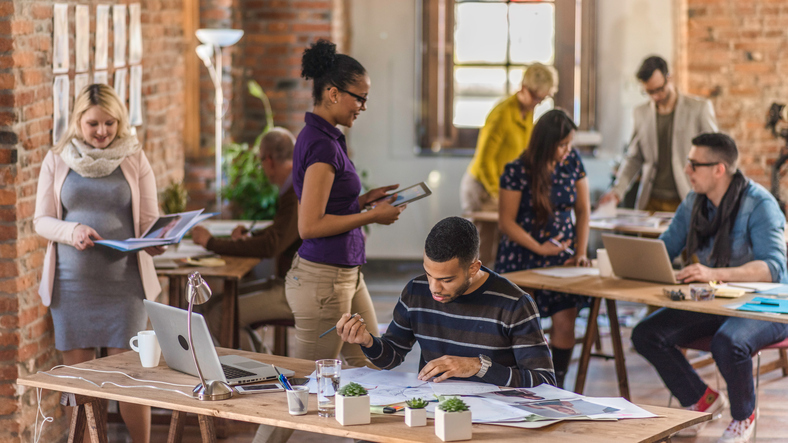 Millennials, in particular, value flexibility very highly and finding ways to accommodate that in terms of hours and telecommuting can pay big dividends for your workplace culture. In a traditional office setting, it is the IT team that generally drives technology standards that employees will need to adopt and use. In a co-working environment, it’s just the opposite. The needs of the members drives what IT must provide. Co-working spaces typically don’t skimp when it comes to technology. They understand the needs and demands of today’s highly connected worker, and they know that if they can’t meet those expectations, workers will quickly go elsewhere. While uniformity can be forced upon employees by the IT department in an organization, flexibility is critical in a co-working environment where workers will be using a variety of technologies and devices. It is the responsibility of the co-working space to ensure that IT can meet these needs, without question. Productivity for those using co-working spaces is paramount, they want easy access to fast, reliable and secure WiFi, cubicles with phone lines and network printers, meeting rooms with the latest in conferencing technology and more. Technology should never be a roadblock to productivity. In fact, many times poor technology will make workers much less willing to go the extra mile. When you provide technology that increases the productivity of employees and tools that go beyond the minimum baseline of what is needed to get by, you’re removing the constraints that limit options for new and innovative solutions to problems, and you’re setting your employees and your organization up for success. Coworking spaces are on the rise for freelancers, contractors, startups and more. Understanding what makes them so effective can help you understand what you can do as an office manager or employer to help boost your own work environment. From providing the technology and tools employees will need and use, to building community by mixing up departments to offering more flexibility with scheduling, you can use these tips to improve your office culture and create an environment geared toward success. Adjust your floor plan so employees are near people they wouldn’t otherwise interact with. Offer flexible hours so your team has more control over their day.